“The only thing that remains constant is change”. Yes, this has become our attitude, and will remain our legacy to pass down. There has been more development in the past hundred years than the entire span of time since human-origin. Moore’s Law still holds strong. We are in an age where our passion and abilities are our hammer and sickle. Competition is round every nook and corner; name any domain. To keep up to this scurry change we need to regularly equip ourselves in our areas of interest and domains of development. The Department of Computer Science gave students this chance to upgrade ourselves. We had Revelations 2015, our intra-departmental fest this February. An annual fest which lasted for about half a month. 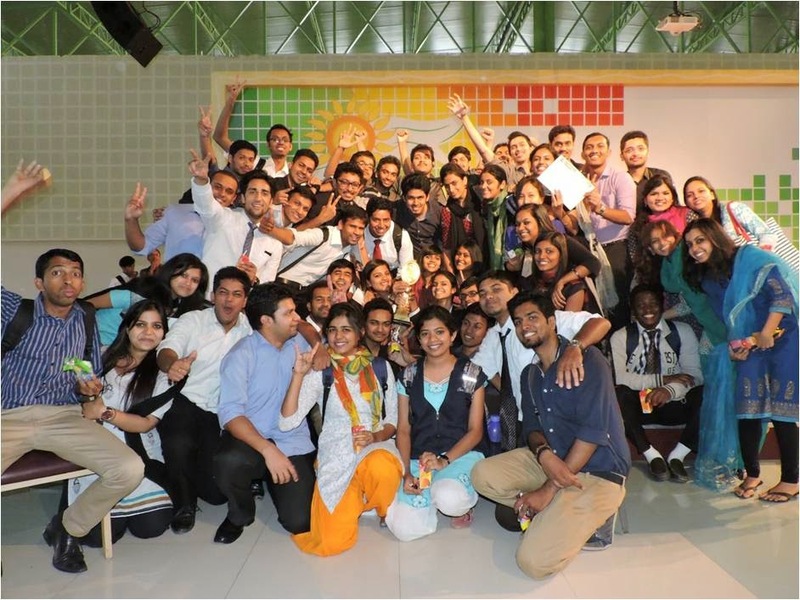 Three teams were made of the entire lot of students, who went all out to show their expertise and abilities to change. Yes, Transmute was the theme for this year and each team was represented by the three robots Asimo, Kirobo and Aibo, depicting how change is intruding into our lives and how society at large is accepting it. The fest provided a platform for young talent to bloom. Many found their hidden gifts and others faced and overcame their fears. While events like Coding, Gaming, Dance, Singing, Football, Throwball, Treasure hunt, Chess, JAM and Debate had prelims on January. Coding showed us where we stood in the IT world, others had another tale to tell. Quiz was interesting having teams biting their nails to prompt an answer within seconds. It was amazing to witness the children in us, who gave headshots in every two steps; Gaming. The likes of Dance and Singing revealed the rich heritage we still carry along with us. Events like Football, Throwball tested our physical skills, and Treasure hunt and Chess our mental skills. JAM(Just A Minute), Best Manager, Product Launch, Team Management, all called for quick wit and a stable stand. The events touched on every aspect, be it mental, physical or emotional. The final day of Revelations 2015 on 5th February, was inaugurated by Mr. Edvin Varghese who is the founder and CEO of Appface Technologies Pvt Ltd. He gave us an insight into the change around us and some tips to cope up with it. This day had in store all the finals of events. The events consisted of Quiz, Best Manager, Product Launch, Photography, Team Management and Short Movie. It was a tussle! All three teams put in their best to become the overall champions. The closing ceremony of Revelations 2015 saw our chief guest Dr. Vagishwari Head of the Department of History impart some words of wisdom to us. Points wise Team Asimo turned out to be the overall winners. But we all were winners in our own way. Revelation 2015, truly stood up to its theme of Invent.Discover.Reveal. We all changed! Being a part of the fest was truly a remarkable experience, one to be cherished and never forgotten. 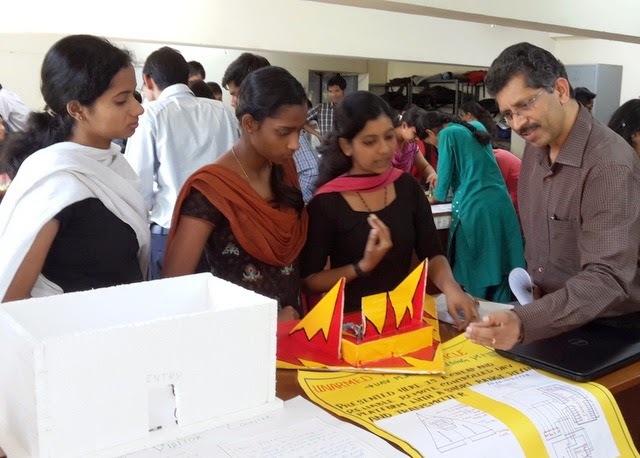 The Electronics Club had organized its Annual Project Exhibition on Friday, 20 Feb 2015. The students of VI SEM BSc PME and CME participated with their working projects. 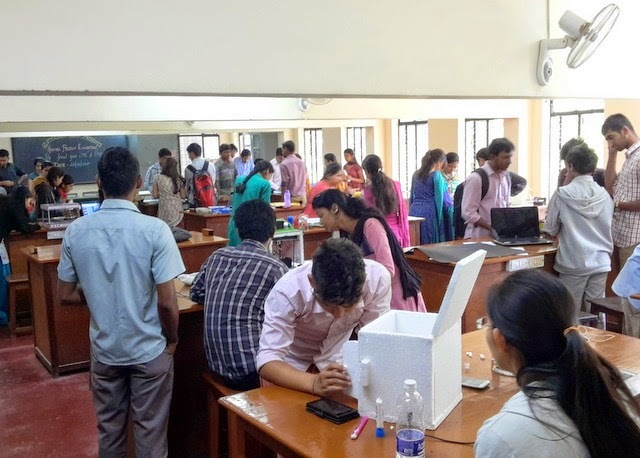 It was arranged in the Electronics Lab, I Floor, Block I between 12 and 2 pm, with 27 teams participating in the exhibition. As a part of their lab work for ELE 652, students completed the projects under the guidance of faculty members of the department. They demonstrated the working of their projects using charts and models to the visitors. The exhibition covered various Electronic Projects like War field spy robot, Home automation using Bluetooth, Aurdino based Door lock system, Human detection Robot, Wireless message Display system, Temperature monitoring system, RFID based attendance, Density based traffic control system, Automatic street light controller, Smart energy meter, Digital Clock, Gesture Translator, Bidirectional visitor counter and Smart stick for visually disabled persons etc to name a few. 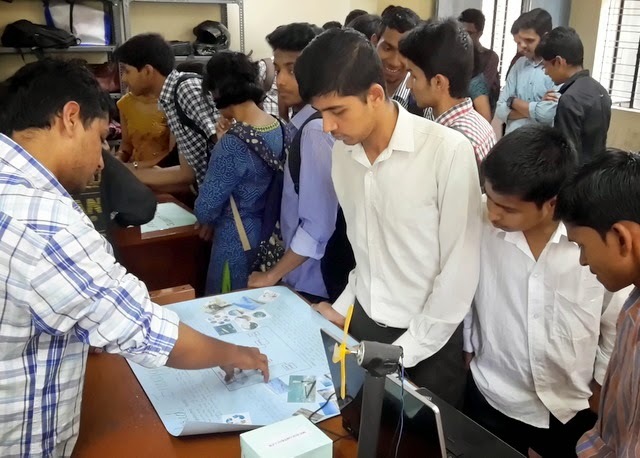 The students of Electronics from all the junior classes visited the exhibition and interacted with the senior students. Some of the visitors were from other classes and also from other streams. 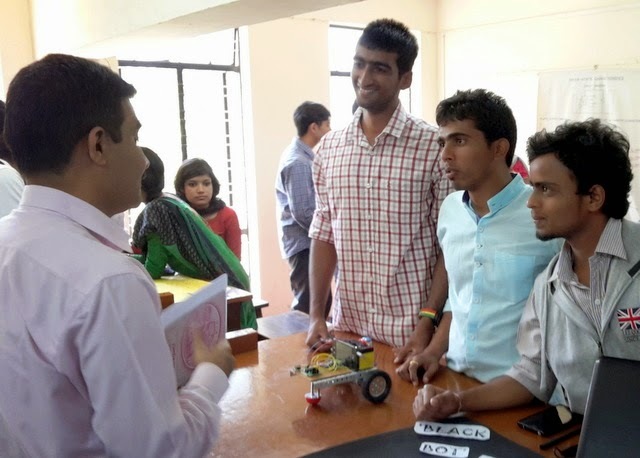 This exhibition was arranged as a part of Electronics Club activities and the faculty members of department of Electronics provided guidance to the students for the successful execution of the program. All the students, the participating teams as well as the students visiting the exhibition enjoyed the event. Electronics Club organizes one awareness program every year and this year an Awareness campaign on Renewable and Non-conventional Energy Sources was organized by the II year BSc (PME and CME) students on Friday, 31 January 2015 as a part of Electronics Club activities. 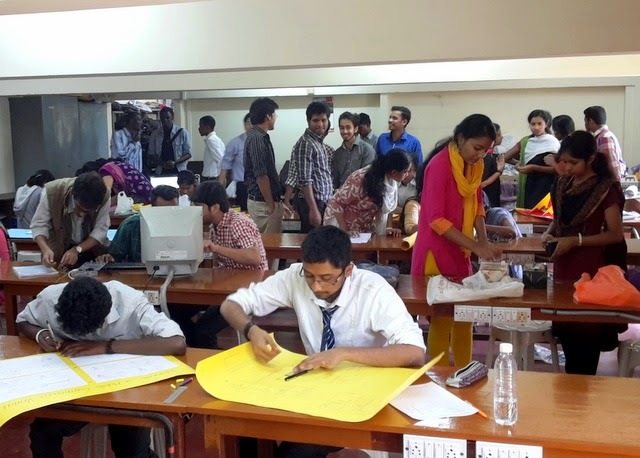 There were about 28 teams from both PME and CME classes taking part in this campaign which was held in the Christ University Campus. The students explained the significance of understanding the need for alternate energy sources. They also showed the charts and power point presentations with a lot of statistics to highlight the need and requirement of renewable energy sources. Some groups also collected information about the recent developments in the field of alternate and eco friendly methods of generating energy. The participating teams were very happy after the event that, they could sensitize their fellow friends, Christies with regard to the renewable and alternate energy sources. The annual undergraduate departmental non-technical fest, Techleons 2015 was inaugurated in a beautiful joint ceremony with the postgraduate fest Revelations 2015 on 5-2-2015 at 9:30 am. Mr. Edvin Varghese, Founder & CEO Appface Technologies Pvt Ltd was the Chief Guest at the function and delivered an interesting and motivating welcome speech. A new and improved edition of the Department of Computer Science internal e-newsletter, Tricky Techies was released at this function in a very unique and interesting manner. The Techleons video was then released which was created and visualized by Tharun and team of BSc (CME). The video was in keeping with the theme of the fest- Super heroes vs Super villians and drew a lot of appreciation and cheers from the audience. Overall, it was a triumph that did the department proud. The events began at 11:00 am. The fest had 10 events- five technical and five non-technical. The technical events were Strykers Lab (Coding and debugging), Sling it & web it(web designing), Jarvis(Interface design), The Riddler (Quiz), Danger Room(Gaming). On the other hand, the participants tried their hand at a variety of interesting non-technical events such as Hunt for the Kryptonite (Treasure Hunt), Win it in a Flash (Minute to Win it), 60 seconds to Doom(JAM), Hidden Agendas(Dumb Charades), Mega Mind(Product Launch). The events saw a lot of enthusiasm from all 550 participants from the Department of Computer Science (BSc and BCA courses), who had been divided into four teams- Wolverine, Iron Man, Loki and Joker- again, keeping in with the theme as in the Super heroes vs Super villians. After an exhausting yet inspiring and fun event-filled day, the valedictory ceremony began at 3:00 p.m. Dr. Srikanta Swamy, Professor and Additional Director, Centre for Research , Christ University graced the occasion with his presence as chief guest.He was an integral and much beloved part of the ceremony, and proceeded to give away the prizes for the various events. He delivered an inspiring speech on research ideas. All in all, the event was a grand success and a great learning experience for everyone involved- it taught lessons in teamwork, participation and dedication. 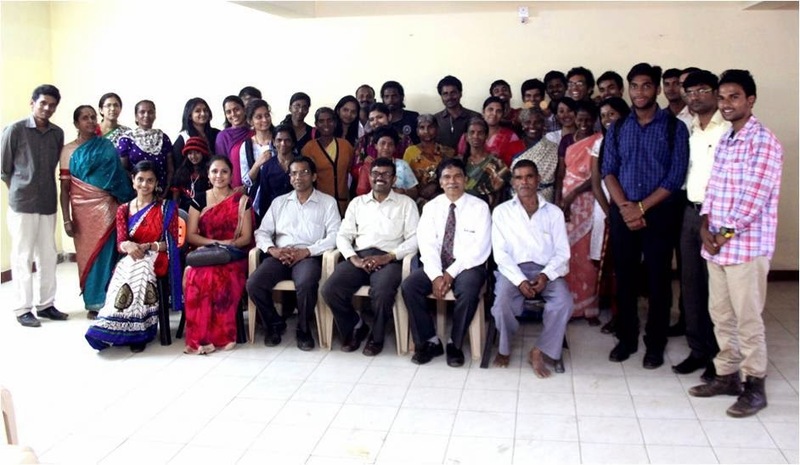 Techleons 2015 was well organized by the student in-charges, Jyothi Guptha , Akhil M Nair and Sheryl Gomes under the supervision of the faculty co-ordinators Ms Vijalakshmi Nair, Ms Deepa V Jose and Mr K.N.Saravanan. 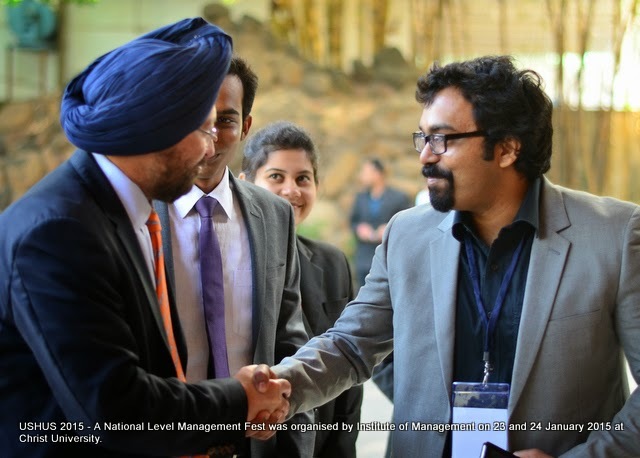 Institute of Management, Christ University organised National Conference on Contemporary Business Challenges and Strategies on Friday, 6 February, 2015, Timings: 9am – 5pm. The national conference theme revolved around General management, Financial management, Marketing management, Lean Operations and Systems management, and Human resource management. The conference started at 9am with the registration process. Introductory note was presented by Prof. Sirish V., Institute of management. Welcome address speech was given by Dr. Suniti Phadke, Dean, Institute of Management. This was followed by key note speech by Ms. Shoma Bakre on conference the theme “Contemporary Business Challenges and Strategies”. In the plenary session, four presentations were done by Yogish Shanbag, CEO- Pupleframe Technologies Ltd., Bangalore, Dr. Hari Krishna Maram, CEO- Imperial Group of Institutions, Bangalore, Ramesh Kumar V. CEO- Biztoons Pvt. Ltd., Bangalore, and Dr. Sharda S Nandram, Associate Professor, Nyenrode Business Universiteit, Germany. We had around 100 plus participants which include 10 delegates, faculty members, M.Phil scholars and MBA students. On the day, we had 30 research paper presentations in two tracks, including the plenary session. The tracks were chaired by Dr. S. Jeevananda, Institute of Management, Dr. Maruti Ram R., Dayanada Sagar Institutions, Bangalore, Dr. Swaroop Reddy, Principal & Professor, International School of Management Excellence, Bangalore, and Dr. Padma Srinivasan, Institute of Management. Two best paper awards were given at the end. These were bagged by Jay P Trivedi from Alliance University, Bangalore for his paper titled “Effectiveness of In-App Advertising on Gen Y’s Attitude and Purchase Intentions”, and Sathyanarayana S from M.P. Birla Institute of Management, Bangalore for his paper titled “An analysis of Day-of-the-week Anomaly in the Indian Stock Market: Evidence from Bombay Stock Exchange”. In the valedictory function, the certificates and the prizes were presented by Rev. Fr. Thomas T.V., Director, Institute of Management. Education for Sustainable Development develops competencies. In order to ensure a sustainable future, we need to assume responsibility for our actions and dedicate ourselves to build positive social and environmental change to promote well-being and improve quality of life now and into the future. It is a significant task; education is the channel through which it can be realised. The aim of the one day National Seminar on Research in Education for Sustainable Development was to provide a platform for presentation and discussion of ideas, to help transform the way the world views education and sustainable development, ensuring that sustainable development can be incorporated into the curricula at all levels of education and in all levels of society. 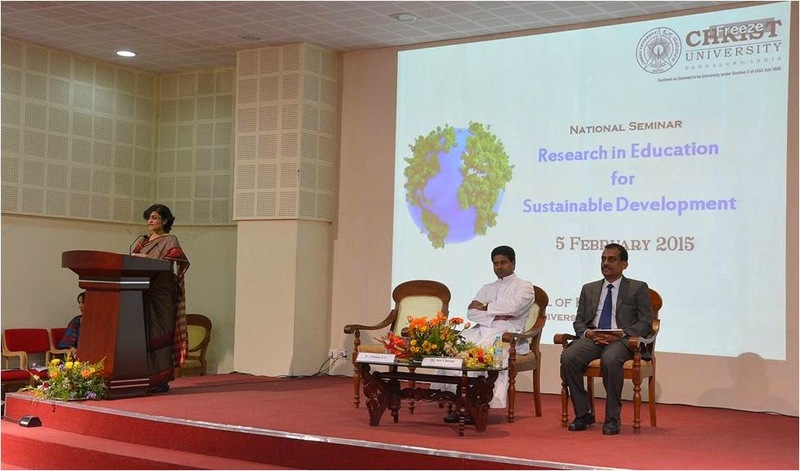 The National Seminar was designed to provide a platform to enable research scholars, students, teachers and experts in the field of Education to present perceptions, debate, discuss and design new projects, programmes and initiatives with regard to curriculum and classroom transaction through paper presentations and deliberations. *To raise awareness and understand the nature of research in education for sustainable development. *To suggest strategies, for sustainable development to all stakeholders in education. 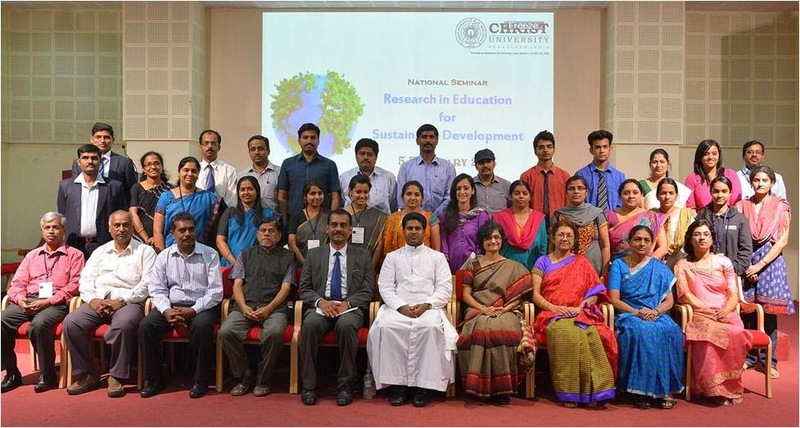 Dr. Jose Cherian (HOD, School of Education), Dr. Greta D’Souza, the convenor, National Seminar, the delegates, the participants, faculty and students of the School of Education, Christ University.This set the tone for the seminar. We had around 50 participants- research scholars, teachers, teacher educators, heads of institution, alumni, besides our own in house faculty and PG students from the departments of Psychology, Economics, Commerce, Hotel Management, English and Education, students of B. Ed in the Seminar. Our gratitude to Fr. Thomas T V, Director, School of Education, Dr. Mallika Krishnaswami , Dean, Humanities and Social sciences for providing encouragement in all our endeavours. 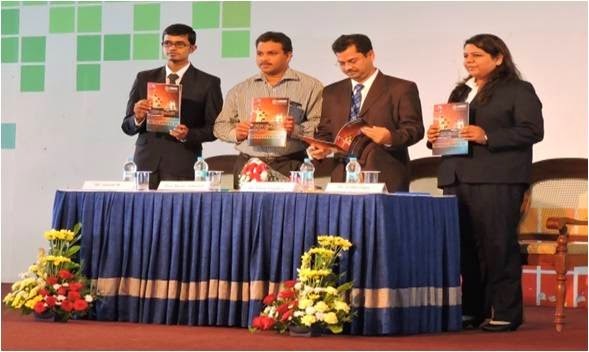 Sincere thanks to Dr. Srikantaswamy, Dr. Kennedy Andrew Thomas, Dr. Elangovan, Dr. Mahesh and Dr. Sheeja Karalam, for chairing the technical sessions, demonstrating research competencies, for giving an excellent coverage for papers presented and for the enormous cooperation in this event. It was indeed a learning experience. Thanks to the organising committee, Dr. Samson, Dr. Jacqueline, Dr. Prakasha, Dr. Sumita who facilitated in the testing, selection/ rejection, modification, reporting and in the entire the review process. The discussions and deliberations in this seminar would help us to reflect, respond and create changes in education now and in the future. School of Education, Christ University. On 14th February 2015, around 2:30PM the faculty Dept. 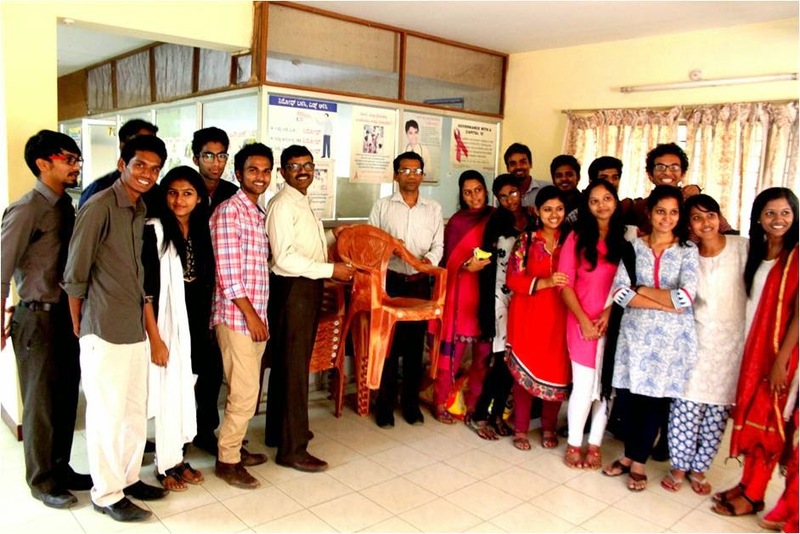 Computer Science & Engineering, CUFE visited Holistic Care (HIV/ AIDS) Centre, Sumannahalli, Bengaluru as a part of CSA activity. Faculty along with a few CSA volunteers spent a quality time interacting with the patients over there. Provisions/ groceries, 34 fibre chairs and a cheque of Rs4000 was given as a contribution to the care centre. Prof. K Pradeep Kumar as the dept.’s CSA in charge coordinated with the overall activity. The head of care centre introduced the HIV/ AIDS patients to faculty and there was an interaction session happened for half an hour. 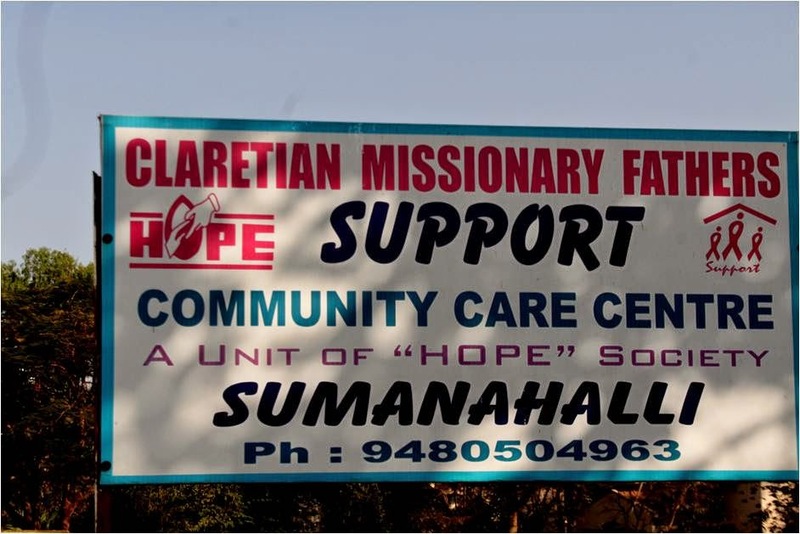 After which care centre head Fr. Jojy gave a presentation on the history of care centre, about the CMF congregation as well as information on HIV/AIDS and foster families. Prof. Glady added to the same and explained his relationship with Fr. Jojy and other service activities. Prof. Balachandran, HOD, dept. of CSE gave his talk on the experience he had visiting the holistic care centre and encouraged the faculty, students to support on all future endeavours of CSA. At the end, an 8 year old girl named Renuka gave a dance performance which was well appreciated by the crowd. CSA volunteer named Raveena also performed singing pleasant songs. Without a shadow of a doubt, it was a rewarding experience. It was deeply touching to see the resilience of the people at the care centre, even with problems was able to cheer, laugh and dance. 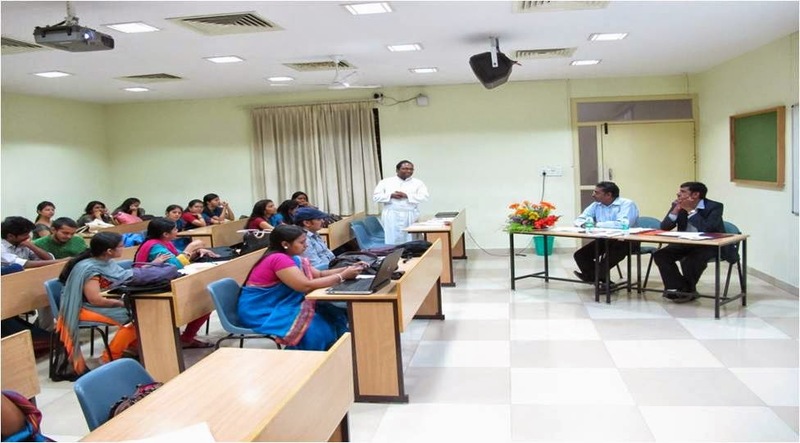 The third Alumni Meet of the department of Biotechnology of Christ University was conducted on January 26, 2015 in Room No.13, Block I of the main campus. The event was jointly organized by the Alumni Association under the leadership of Mr Jugnu Oberoi and the Department of Biotechnology. Since its inception in 2007, five batches have passed out from the department of Biotechnology. Around 35 alumni members came for the meet. The event kick started with a welcome by Dr Suma S, faculty in charge of Biotech Alumni Association and address by Dr Louis George, HOD. Celebrations included cake cutting, various games like Quiz and Dumb Charades and sharing of the experience and feedback by the alumni members. The faculty and the students had a photosession. 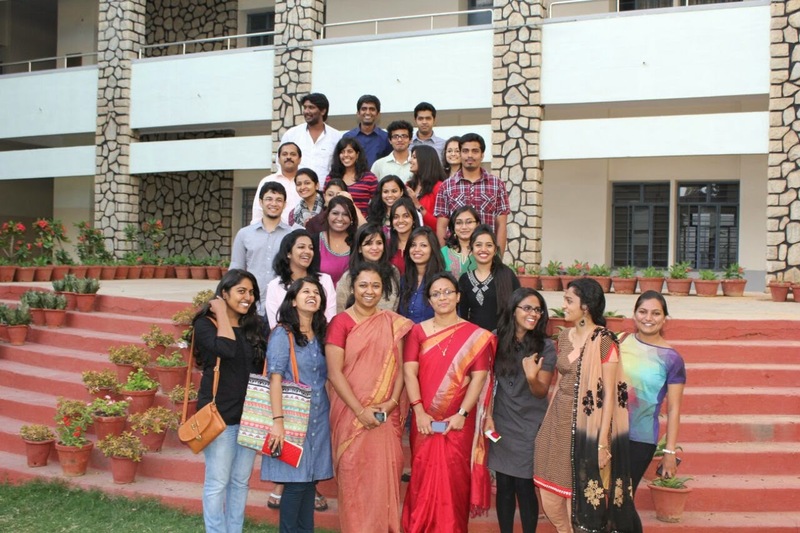 The day ended with a happy bunch of people – both the alumni and the faculty - going back home with a contended heart. Christ University Kannada Sangha (before Christ College Kannada Sangha) has great reputation among its counterpart organizations and outside for being unique, productive and active. Christ University Kannada Sangha has a big name in Kannada publication field. It is one of the powerhouses in the field of publication. Christ University Kannada Sangha brought out its unique recent publication "Matte bantu Shravana", on the occasion of "Kavidina" which celebrates the birthday of gifted Kannada poet D.R. Bendre. "Matte bantu Shravana" is a collection of 131 best poems written by 96 poets. These were prize winning poems of "Dr. D.R Bendre kavitaa sparde", a state level poetry competition conducted for students by the Kannada Sangha of Christ University since 1982. The book was released by famous Kannada writer, critic, Devanoora Mahadeva. During his speech after releasing the book he said, new generation writers should follow the paths laid by old poets like Pampa, Vachanakaras, Kumaravyasa, K.V Putappa and D.R Bendre and others. He called upon the students to start a new legacy with the old tendency without being parallel to the old. He spoke about how D.R Bendre lived and loved poetry. Reviewing the book, noted poet Tarini Subhadhayini said, poems in the book are as cool as breeze. It is a very difficult job to pick and choose the best among best poems. None of the poems fall under any of the new Kannada genres i.e. Navodaya, Navya, Bandaaya- Dalita etc. We find in the collection, the blend of ideas, styles of all genres, this is the specialty of the book, she said. Poems written by the students for around 3 decades give us the clear picture of the change in the ideologies, style in literature, she added. Editor of the book Dr. Vikrama Visaji spoke about how Chi. Srinivaasaraju reached every nook and corner of the state by conducting poetry and essay writing competitions. This initiative of his, has nurtured lots of enthusiast, passionate young poets and writers. The only Kannada Organization that is very consistent in its programs is Christ University Kannada Sangha, he added. 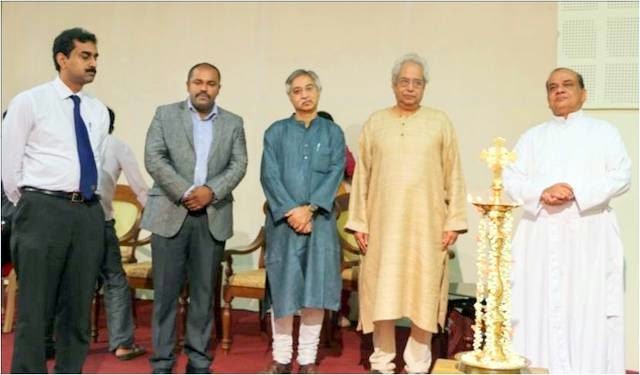 H.S Venkateshmurthy, famous poet who was the Chief Guest of the function said, Christ University Kannada Sangha's publication brought good name and fame to the University. Many good established writers of today like Mogalli Ganesh, Abdhul Rashid, Nataraj Huliyar, and Kavita Rai among others give credit to Christ University Kannada Sangha for giving them a platform to showcase their talents and to express them. Most of the poems in the collection are interesting, intense and beautiful, he said. He complimented Christ University for bringing out such a good collection of poems. He also mentioned that Christ University is the best example for encouraging budding writers by creating a platform to express their spectrum of thoughts through writing. Financial officer of Christ University Fr. Dr. Varghese who presided over the function said, this book is a treasure of 3 decades of good poetry writing. Students of this generation are not cultivating good habit and taste. He insisted the students to cultivate the habit of writing. Vikrama Visaji, H.S. Venkatesha Murthy and Saraswatiraju (wife of Chi. Srinivaasaraju) were honored. Noted writers, H.S. Raghavendra Rao and O.L. Nagabhushanaswamy were present in the function. 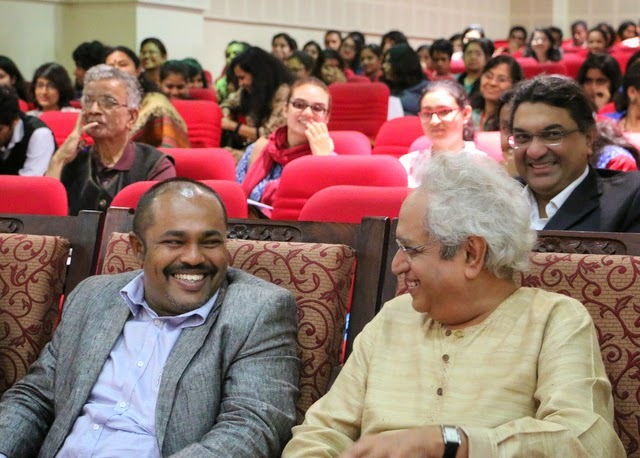 The Department of Psychology, Christ University, organized a two-day seminar on Culture and Psyche: Sudhir Kakar’s Contribution to Indian Cultural Psychology and Psychoanalysis on 9 and 10 January 2015. 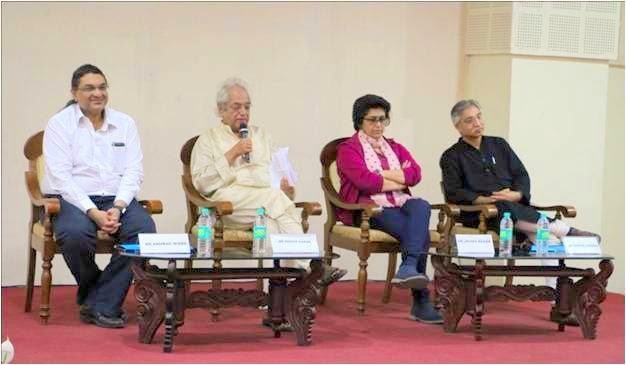 The seminar was both a meeting ground for academicians, students and scholars and an occasion to honour Dr.Sudhir Kakar who has made immense contributions to cultural psychology in India. The inauguration ceremony began with an invocation dance which set the auspicious tone for the programme. This was followed by the lighting of the lamp by the dignitaries and the welcome address by Dr. Tony Sam George - Head, Department of Psychology- in which he astutely observed that the two days ahead would be a truly ‘intellectual experience’. Dr. Fr. 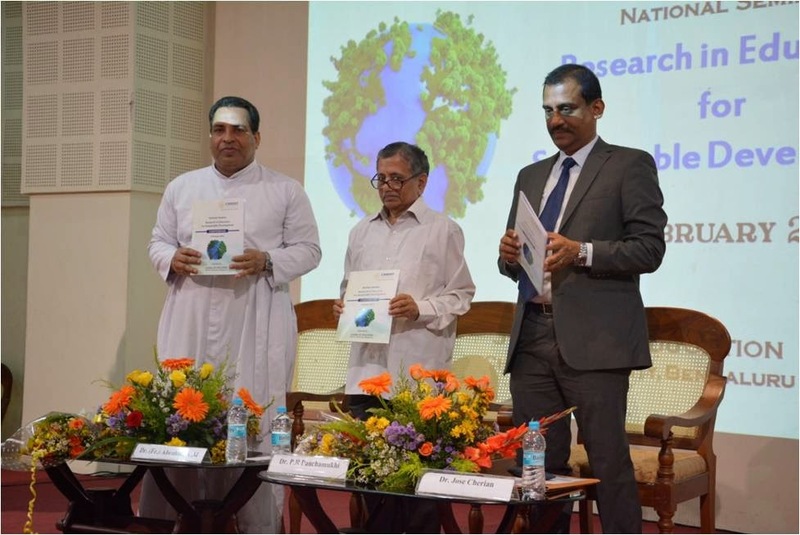 Thomas C. Mathew, Vice Chancellor, Christ University, in his inaugural speech, highlighted the uniqueness of the Indian family system with its wide support networks. This was followed by a fitting tribute to Dr.Sudhir Kakar by Dr. Baiju Gopal – Convener of the seminar. Dr.Kakar was then felicitated and presented with a memento by Dr. Fr Thomas C. Mathew. The last to take the stage and yet the most awaited one, Dr. Kakar gave new meaning to the phrase, ‘with great knowledge comes great humility.’ His light-hearted tone, even when addressing intense questions was intertwined with light hearted humour and made listening to him an absolute pleasure. He spoke of his foray into psychoanalysis and cultural psychology and how it unconsciously also involved the critique of many western assumptions that have enveloped cultural psychology for a long time now. Stating that psychoanalysis has its faults, he was of the view that it still has many insightful tenets which makes it a very satisfying approach for understanding the human mind. With its focus on the unconscious, importance of childhood experiences, the role of eros in human motivation, conflict between the conscious and the unconscious and the function of transference and counter-transference in therapy, Dr. Kakar believes that psychoanalysis is still one of the most comprehensive schools of psychology. 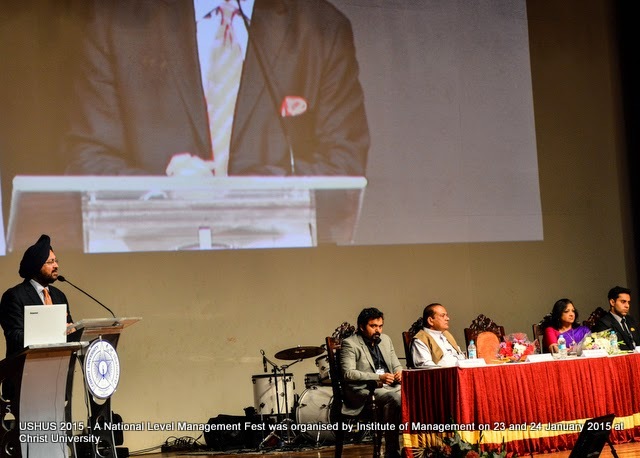 Following the inauguration ceremony, the keynote address was given by Dr. Ashok Nagpal, Professor of Psychology and Dean of Academic Services, Ambedkar University, Delhi. He stated that his tryst with psychology and psychoanalysis has been an attempt to “unfold the layers of culture and psyche.” In view of his long term association with Dr. Kakar, he very rightly said that we should not only appreciate the grandeur of his work but also the grandeur of his being. He traced Kakar’s journey from his seminal work - ‘Inner World’ - to his autobiography ‘A Book of Memory’, which he believes portrays the culmination not only of an individual’s relations with self and others but also narrations that are unique because the reader feels involved in them. He also gave brief yet perceptive reviews of some of Dr.Kakar’s books, including ‘Colours of Violence’ ‘The Analyst and the Mystic’ among many others. Interwoven into a highly intellectual session was a tone of subtle humour, giving one the feeling of having listened to an insightful discourse but not getting drained in the process. The highlight of the first day was the session titled ‘Conversations with Dr. Kakar.’ It was a highly interactive session with questions from students, teachers and scholars on a wide variety of topics. Some of the themes addressed were importance of dreams, after-life, past life regression, cultural competency, importance of including indigenous methods into mainstream psychology, gender discrimination, nature of a psychoanalyst, conflict between one’s personal and cultural identity, Electra complex, importance of the relationship between mother and son and so on. Each question was answered in detail, with examples which further validated Dr. Kakar’s astounding grasp of psychology and cultural psychology. As many questions were asked on gender and culture, he also spoke at length on these two topics. According to him, trying to interpret culture keeping only gender in mind does not give the whole picture. 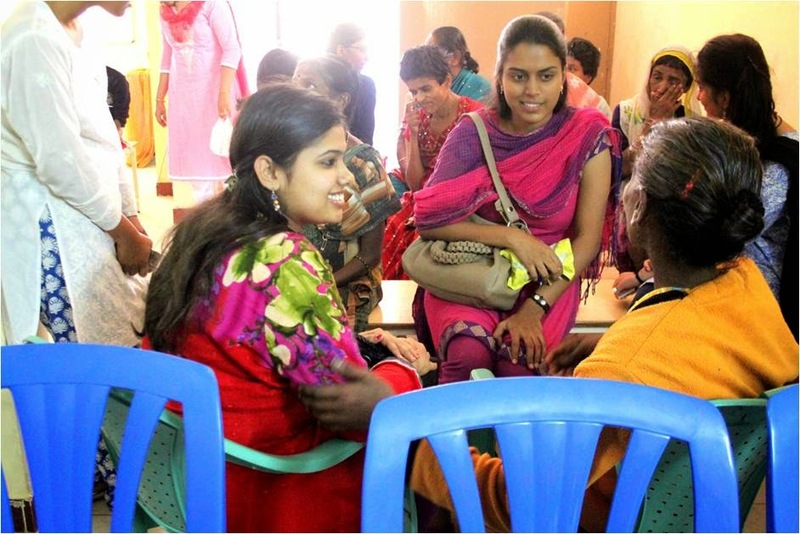 In the Indian context, one of the biggest changes is with regard to Indian women since there has not only been an increasing acceptance of women’s education but also an expansion of domains where women can work. He conjectured that if men felt threatened as a result this might explain the increasing rates of violence in our country. The post-lunch session was facilitated by Dr. Jhuma Basak, a trained psychoanalyst, (Kolkata) and her focus was on a very interesting topic, titled ‘An Intimate Discourse on the Other Woman.’ She drew parallels from prominent women characters in cinema, namely Ijaazat, Chokher Bali and Abohoman. These movies were characterized by two women characters that were in stark contrast to one another. As shown in Abohoman, Shikha is the embodiment of the other woman, being loud and crass whereas Deepti is sophisticated, poised and soft. Drawing from the stories in these movies, Dr. Jhuma went on to show that the other woman is never publicly acknowledged; there is no social acceptance and no public recognition for her. She also included Jayadeva’s Gita Govinda to show how the ideal woman is and how Radha is portrayed as her angry self in Ashta Nayika and what that implies. She also briefly touched upon aspects such as intimacy and physical space and their implications for women. The first day of the seminar was concluded with a symposium, titled ‘Hisses, Misses and Lonelier Tones- Musings on Indian Womanhood through Kakar’s works’. There were three presentations which touched upon various subjects and domains that have been explored in Kakar’s works by Dr Shifa Haq, Mr Ashis Roy and Ms. Shalini Masih, research scholars from Ambedkar University, Delhi. The second day of the seminar began with paper presentations, with three concurrent sessions on ‘Intimacy and Ecstasy’, ‘Psychoanalysis, Religion, Mysticism and Healing Traditions’ and ‘Identity, Politics and Culture.’ As one can gather from the titles, the session were an excellent attempt by the presenters to take the audience on a stimulating journey. There was also a special lecture ‘Travelling towards a Psychoanalysis of Terroir with Sudhir Kakar’ by Dr. Anurag Mishra, eminent psychoanalyst and psychiatrist at Fortis Hospital, Gurgaon. According to Dr. Mishra, terroir is an ‘evolved expression of culture.’ In course of the talk, he also commented on the phenomenon of ‘Safari Psychoanalysis,’ where an individual who is foreign to the culture comes and attempts to understand the culture akin to a jungle safari, where everything is seen only from a surface point of view. He also reflected on Kakar’s ‘Book of Memory’ which according to him is the “Indian view of a person who is open, porous and connected to all of existence.” The lecture was brought to a fruitful conclusion with his remarks on how psychology can be understood as a spiritual discipline. Following this was the second symposium titled ‘Political culture, Folk epic and psychoanalysis: Reflection on Kakar’s works.’ Presentations by three knowledgeable scholars - Dr P Krishnaswamy, Professor & Director, TQMS, Christ University, Dr William Robert D’Silva, Professor of Media & Communication and Dr Chetan Sinha, Assistant Professor, Department of Psychology, Christ University ensured an enriching session. Their discourses on faith healing and Kakar’s academic legitimacy, psychoanalytical and evolutionary neurobiological interpretation of nature and culture in psychoanalysis in India and the context of social class and psychoanalysis in India were well receive. The valedictory function was graced by the presence of Dr. Anil Pinto, Registrar, Christ University. He addressed the gathering about the importance of such seminars which help in broadening the knowledge of academicians, as well as the need to have knowledge generation in Indian vernacular languages. Overall the seminar was an enriching academic journey. 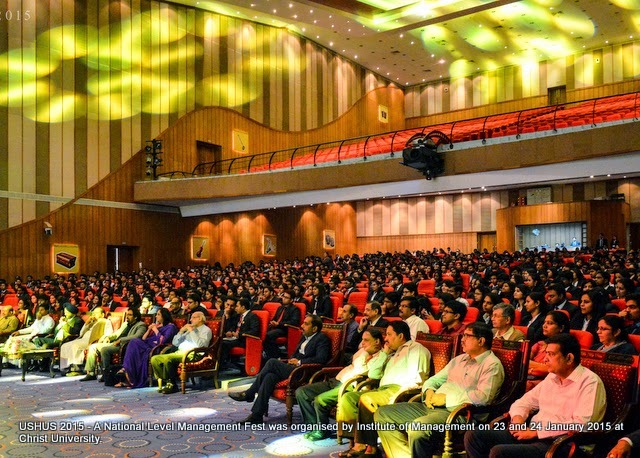 The hoi polloi of Christ University, especially the MBA students had a whale of a time on 23 and 24 January, USHUS 2015 the annual national level management festival of Institute of Management. The theme of USHUS 2015 was Circumpunct, the origin of all symbols. The corporate sponsors for USHUS included South Indian Bank, JBL, and Zoom Cars. Analyttica and en Paradigm associated with USHUS 2015 as knowledge partners. 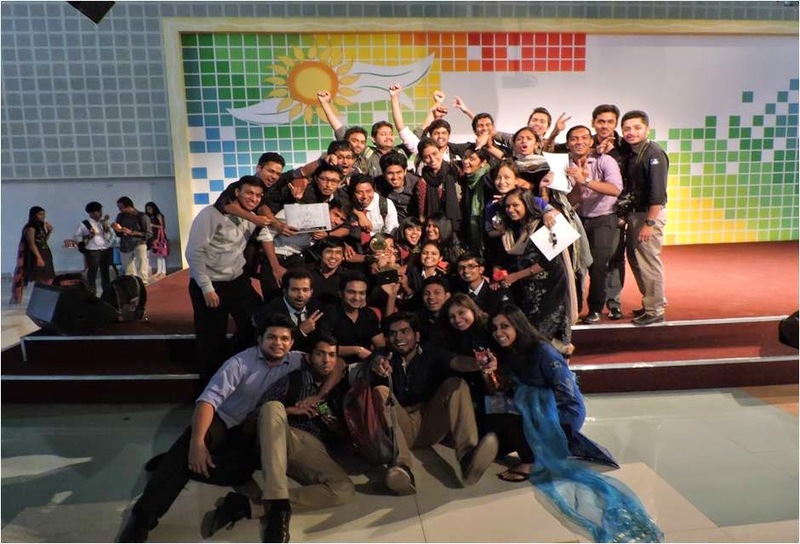 The online promotions of the event started months in advance and the selfie contest for the students made the social media presence of USHUS 2015 a celebration. Students were encouraged to post a selfie taken inside the campus with the hashtags #nammachristuniversity and #ushus15 and the selfies won a prize every day. The winners of the contest were given away prizes on the last day of USHUS 2015. The inaugural ceremony was presided over by Honourable Vice Chancellor of Christ University, Rev. Fr. (Dr.) Thomas C Mathew. Vice President of ITC Hotels, Mr. Ranvir Bhandari was the Chief Guest of the day whose inspirational speech was the highlight of the day. Dr. Suniti Phadke, Dean Institute of Management and Dr. Binu P Paul, faculty coordinator for USHUS 2015 addressed the gathering. 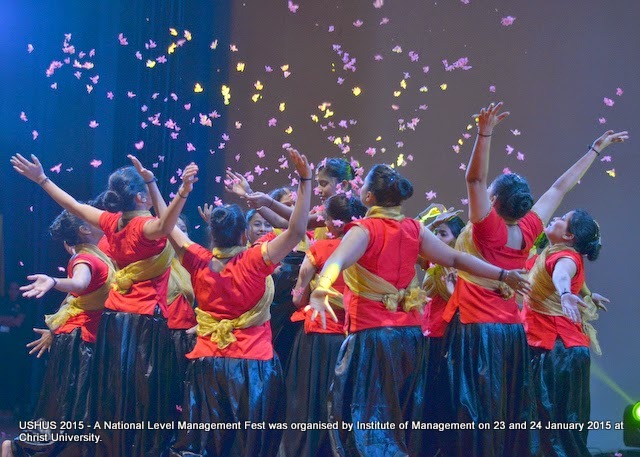 After the formal ceremony and a mesmerising musical treat by team RAAG, the student music band from Institute of Management, the 400 odd participants where escorted by the volunteers to designated event venues. 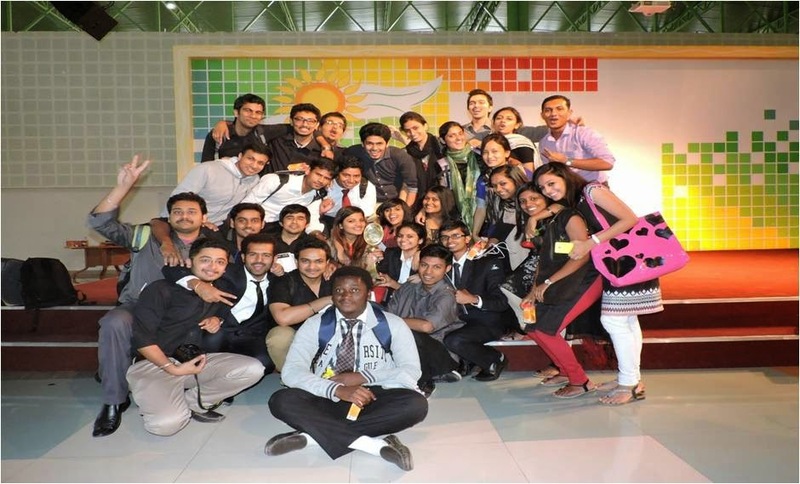 USHUS 2015 witnessed excellent participation from across the country and received very encouraging involvement from MBA institutes in Bangalore and other parts of South India. The events, which were organized under various functional areas, were well appreciated by the participants. The main events that were held in the auditorium on the second day were Quiz and Best Manager. Quizmaster Mr. Vinay Mudaliar put on a grand show on the stage. The crowd were witness to some brilliant guesswork and on the spot thinking. After the Quiz event, the most awaited event of the day, The Best Manager Event started with a lot of expectations and it didn’t disappoint any. The finale was a stress enhancer for the organizers. It was all about keeping one’s calm. The judges, mostly ex-Christites in influential positions, made sure that the participants were subjected to intense scrutiny. Deputy General Manager of South Indian Bank was the chief guest for valedictory session. The winners of various events were awarded cash prizes and trophies. Rev. Fr. 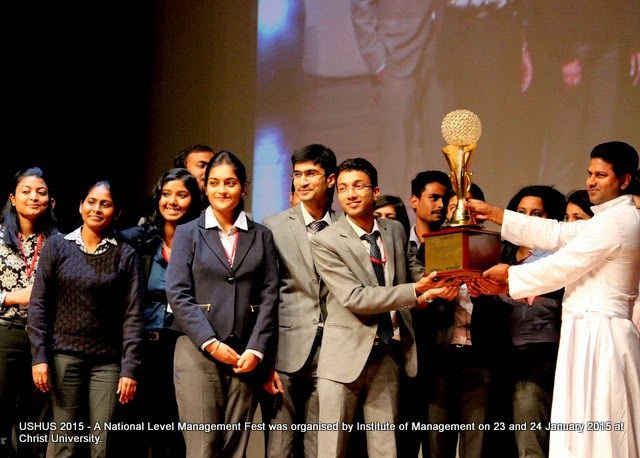 Thomas TV, Director, Institute of Management presented the trophy to XIME Bangalore, the overall winners of USHUS 2015.